I recently became a huge fan of British comedic actress Miranda Hart. I have my husband to thank for this. He got hooked on Call the Midwife. Yes, you read that right; my husband got hooked on the British drama, Call the Midwife. He can tell you about all the characters, their quirks and foibles. I love him for this. One of my favorite characters is Chummy, played by, you guessed it Miranda. She’s also got her own eponymous sitcom. And today, while on my second listen of Miranda’s audio book, “Is it Just Me?”, I heard her use the word ensconced. She invited her MDLCs (my dear listener chums) to ensconce themselves with a cup of tea and a biscuit to enjoy her book. I approve of this. When I hear ensconce, I think of scones. My absolute hands-down favorite afternoon in England last year was the time we spent in a small café, ensconced in their upstairs room, enjoying a cream tea (that’s where the photo at left is from). Not heard of cream tea? Thinking it’s tea with milk/cream? No. 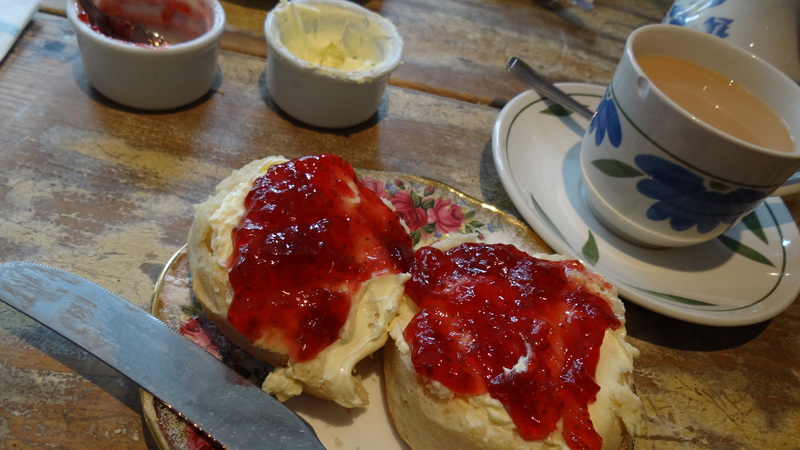 A cream tea is tea taken with scones, strawberry jam, and clotted cream (or sometimes Devonshire or Cornish cream). Back to ensconce. Merriam Webster provides the following synonyms: install, lodge, nestle, perch, roost, settle. I’m a fan of all of these; most especially on a cold rainy day, when I’ve got a good book and warm blanket. And of course, a scone. Ensconced is a perfect Winter word. It paints images of cozy and nestled and snug as a bug in a rug.. I love the visual, and I love the fact that you have incorporated Tony’s lovely photo. You are quite a team. Ooh, it is a winter word. And indeed, Tony’s photo is delish. I want to crawl right back into it and be transported to Port Isaac.